Last night Jen had a fantastically easy night of putting the guys to bed. For some reason they just went directly to bed with little or no fuss. All that was required was a little gentle back-rubbing and the Wombats went straight to sleep. 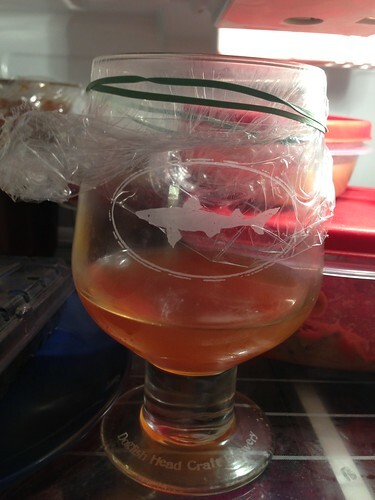 When I got home around midnight I attempted to polish off the remaining 120 Minute IPA in the fridge. It turns out my method for preserving the carbonation didn't exactly work. Take note: don't attempt this technique for yourself. This morning was a mixed bag with Elliott being ready to tackle the day and Martin being nearly catatonic. I was fine with both of their states given that they slept mostly through the night. It seems like the better they sleep through the night the harder it is to wake up in the morning. Eventually we were able to get ourselves out of bed, get the Wombats to day care, and go about our day. I picked the guys up early and took them home to FaceTime with their Nana who was very happy to watch them bounce in their Jumperoo, play int heir walkers, and generally wreak havoc in the apartment as we caught up on things. After our talk they began to get hungry. I fed Elliott first since he was fussing the most and Martin was not happy about this turn of events. Let this serve as a lesson to Martin for the future. The squeaky wheel gets the grease, my friend. Looks like you're going to have to up your fuss game for next time. Once we wrangled the babies to bed, after their baths and after their dinner, I threw dinner together very quickly. 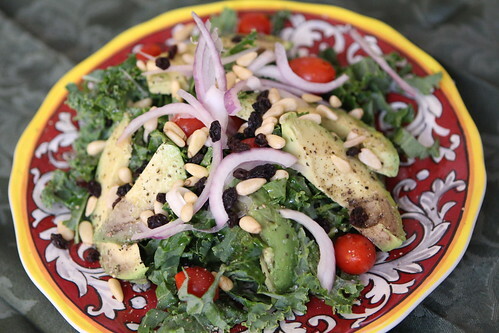 I made this salad with kale, avocado, grape tomatoes, red onion, pine nuts, currants, olive oil, lime juice, salt, and pepper. Total prep time: five minutes. For pizza I used some meatballs that I'd made earlier in the day with ground beef from the freezer, garlic, toasted and crumbled leftover bread, oregano, basil, salt, pepper, Worchestershire sauce, and a little egg. 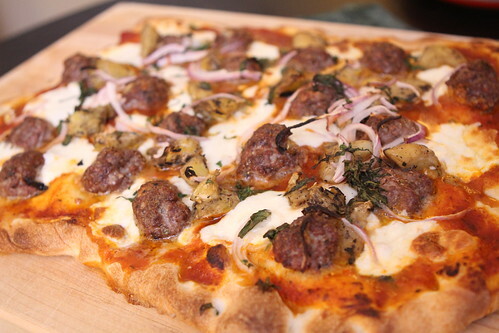 I cooked the meatballs then topped the pizza with them, some mozzarella cheese, grilled artichokes, sliced red onion, and fresh basil. Total prep time: five minutes. In the past week I've had two of the best beers I've ever had in my life: Westvleteren XII and Dogfish Head's 120 Minute IPA. I figured I'd follow that with another beer that is sure to be in my top ten . . . This is a beer that I kept running into and eventually just had to buy before it was too late. If their website is any indicator then production of this beer must have stopped some time in the late 1990s just going on the number of animated GIFs and overall design of the site. 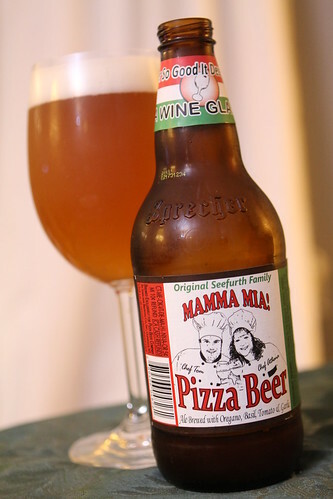 The beer is actually brewed with oregano, basil, tomato, and garlic and the bottle proclaims: Beer So Good . . . It Deserves a Wine Glass! The animated GIFs also makes this claim. The beer tasted heavily of oregano, slightly of the other ingredients, but mostly of water. After consuming a little pizza it was indistinguishable from any crummy lager you'd have with beer. It's definitely an interesting beer but there is a strange blankness to the taste. I feel like it could use something in the way of body to round it out. 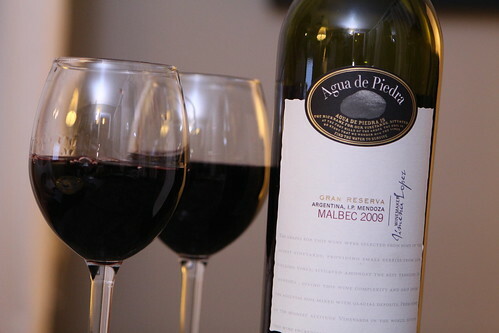 Jen was not having any of this beer so we opened this Agua de Piedra 2009 Malbec from Argentina. A friend had given this to me a couple of years ago and we just got around to opening it. After I was done with my beer I enjoyed a glass of this. It was a nice accompaniment to pizza and a great beer to enjoy with the rest of the hockey game after dinner. Apart from all of this I got some cooking done for the rest of the week so it looks like we'll be in quick and easy meals for the rest of the week. Now I just have to plan out my beer choices a little better.